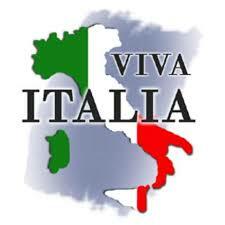 Well, so far we’ve gone Latino and New England, I thought, why not Italian? I love a hearty Minestrone soup, and it tends to fall into that category of Stew-oups that I mentioned before. Soups so chunky that they are almost stews! I love that Minestrone soup in particular tends to turn into a “kitchen-sink” recipe. What ever is left in your vegetable drawer in the fridge, add it in! Got cans of different veggies in the pantry? add them in! It really makes it easy for substitutions as well, as the recipe is not set in stone. You don’t HAVE to use both zucchini and yellow squash, one or the other will do. Don’t have kidney beans? Use navy beans, or chick peas. You’re really only limited by your imagination. 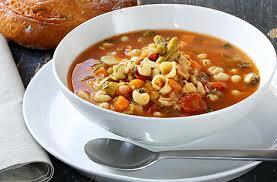 To me, Minestrone soup is a tomato based broth with tons of chunky veggies and some pasta thrown in. Who’s to say which veggies they have to be, or which pasta? The good thing though is that it is so easy to make and so filling, that all you need is some nice crusty bread and a glass of vino and you’re set! Ciao Bella!